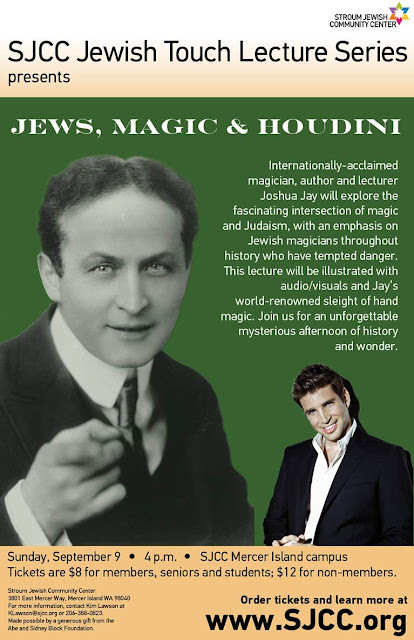 Magician Joshua Jay will give a lecture on Houdini at the Stroum Jewish Community Center in Seattle, Washington on Sunday, September 9 at 4pm. His lecture is called "Jews, Magic & Houdini". It appears to be a modified version of his acclaimed Tragic Magic lecture with a special emphasis on the king of escapes. For more information visit www.sjcc.org. I missed him in LA; any chance he will return to the Skirball or lecture at the CJM in SF? Probably not unless there is some kind of magic themed exhibition.